The Crab Nebula (catalog designations M1, NGC 1952, Taurus A) is a supernova remnant and pulsar wind nebula in the constellation of Taurus. Located at a distance of about 6,500 light-years (ly) (2 kiloparsec (kpc)) from Earth, the nebula has a diameter of 11 ly (3.4 pc) and expands at a rate of about 1,500 kilometers per second. At the center of the nebula lies the Crab Pulsar, a rotating neutron star, which emits pulses of radiation from gamma rays to radio waves with a spin rate of 30.2 times per second. This nebula was the first astronomical object identified with a historical supernova explosion. Observed in 1731 by John Bevis, it was found to correspond to a bright supernova recorded by Chinese and Arab astronomers in 1054. The Crab Nebula acts as a source of radiation for studying celestial bodies that occult it. In the 1950s and 1960s, the Sun's corona was mapped from observations of the Crab's radio waves passing through it, and more recently, the thickness of the atmosphere of Saturn's moon Titan was measured as it blocked out X-rays from the nebula. First observed in 1731 by John Bevis, the Crab Nebula corresponds to the bright SN 1054 supernova that was recorded by Chinese and Arab astronomers in 1054. The nebula was independently rediscovered in 1758 by Charles Messier as he was observing a bright comet. Messier cataloged it as the first entry in his catalog of comet-like objects. The Earl of Rosse observed the nebula at Birr Castle in the 1840s, and referred to the object as the Crab Nebula because a drawing he made of it looked like a crab. In the early twentieth century, the analysis of early photographs of the nebula taken several years apart revealed that it was expanding. Tracing the expansion back revealed that the nebula must have become visible on Earth about 900 years ago. Historical records revealed that a new star bright enough to be seen in the daytime had been recorded in the same part of the sky by Chinese and Arab astronomers in 1054 Given its great distance, the daytime "guest star" observed by the Chinese and Arabs could only have been a supernova—a massive, exploding star, having exhausted its supply of energy from nuclear fusion and collapsed in on itself. The Crab Pulsar. This image combines optical data from Hubble (in red) and X-ray images from Chandra X-ray Observatory (in blue). In visible light, the Crab Nebula consists of a broadly oval-shaped mass of filaments, about 6 arcminutes long and 4 arcminutes wide (by comparison, the full moon is 30 arcminutes across) surrounding a diffuse blue central region. In three dimensions, the nebula is thought to be shaped like a prolate spheroid. The filaments are the remnants of the progenitor star's atmosphere, and consist largely of ionised helium and hydrogen, along with carbon, oxygen, nitrogen, iron, neon, and sulfur. The filaments' temperatures are typically between 11,000 and 18,000 K, and their densities are about 1,300 particles per cm³. In 1953, Iosif Shklovsky proposed that the diffuse blue region is predominantly produced by synchrotron radiation, which is radiation given off by the curving of electrons moving at speeds up to half the speed of light. Three years later the theory was confirmed by observations. In the 1960s it was found that the source of the electron curved paths was the strong magnetic field produced by a neutron star at the center of the nebula. Even though the Crab Nebula is the focus of much attention among astronomers, its distance remains an open question due to uncertainties in every method used to estimate its distance. In 2008, the general consensus is that its distance from Earth is 2.0 ± 0.5 kpc (6.5 ± 1.6 kly). The Crab Nebula is currently expanding outwards at about 1,500 km/s. Images taken several years apart reveal the slow expansion of the nebula, and by comparing this angular expansion with its spectroscopically determined expansion velocity, the nebula's distance can be estimated. In 1973, an analysis of many different methods used to compute the distance to the nebula reached a conclusion of about 6,300 ly. Along its longest visible dimension, it measures about 13 ± 3 ly across. Tracing back its expansion consistently yields a date for the creation of the nebula several decades after 1054, implying that its outward velocity has accelerated since the supernova explosion. This acceleration is believed to be caused by energy from the pulsar that feeds into the nebula's magnetic field, which expands and forces the nebula's filaments outwards. Estimates of the total mass of the nebula are important for estimating the mass of the supernova's progenitor star. The amount of matter contained in the Crab Nebula's filaments (ejecta mass of ionized and neutral gas; mostly helium) is estimated to be 4.6 ± 1.8 M☉. One of the many nebular components (or anomalies) of the Crab is a helium-rich torus which is visible as an east-west band crossing the pulsar region. The torus composes about 25% of the visible ejecta and is composed of about 95 percent helium. As of yet, there has been no plausible explanation put forth for the structure of the torus. This sequence of Hubble Space Telescope images shows features in the inner Crab Nebula changing over a period of four months. Credit: NASA/ESA. 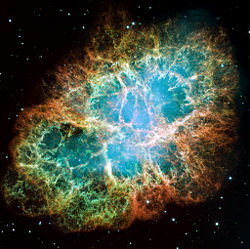 At the center of the Crab Nebula are two faint stars, one of which is the star responsible for existence of the nebula. It was identified as such in 1942, when Rudolf Minkowski found that its optical spectrum was extremely unusual. The region around the star was found to be a strong source of radio waves in 1949 and X-rays in 1963, and was identified as one of the brightest objects in the sky in gamma rays in 1967. Then, in 1968, the star was found to be emitting its radiation in rapid pulses, becoming one of the first pulsars to be discovered. Pulsars are sources of powerful electromagnetic radiation, emitted in short and extremely regular pulses many times a second. They were a great mystery when discovered in 1967, and the team which identified the first one considered the possibility that it could be a signal from an advanced civilization. However, the discovery of a pulsating radio source in the center of the Crab Nebula was strong evidence that pulsars were formed by supernova explosions. They are now understood to be rapidly rotating neutron stars, whose powerful magnetic field concentrates their radiation emissions into narrow beams. The Crab Pulsar is believed to be about 28–30 km in diameter; it emits pulses of radiation every 33 milliseconds. Pulses are emitted at wavelengths across the electromagnetic spectrum, from radio waves to X-rays. Like all isolated pulsars, its period is slowing very gradually. Occasionally, its rotational period shows sharp changes, known as "glitches," which are believed to be caused by a sudden realignment inside the neutron star. The energy released as the pulsar slows down is enormous, and it powers the emission of the synchrotron radiation of the Crab Nebula, which has a total luminosity about 75,000 times greater than that of the Sun. 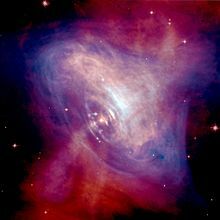 The pulsar's extreme energy output creates an unusually dynamic region at the centre of the Crab Nebula. While most astronomical objects evolve so slowly that changes are visible only over timescales of many years, the inner parts of the Crab show changes over timescales of only a few days. The most dynamic feature in the inner part of the nebula is the point where the pulsar's equatorial wind slams into the bulk of the nebula, forming a shock front. The shape and position of this feature shifts rapidly, with the equatorial wind appearing as a series of wisp-like features that steepen, brighten, then fade as they move away from the pulsar to well out into the main body of the nebula. The Crab Nebula seen in infrared by the Spitzer Space Telescope. The star that exploded as a supernova is referred to as the supernova's progenitor star. Two types of stars explode as supernovae: White dwarfs and massive stars. In the so-called Type Ia supernovae, gases falling onto a white dwarf raise its mass until it nears a critical level, the Chandrasekhar limit, resulting in an explosion; in Type Ib/c and Type II supernovae, the progenitor star is a massive star which runs out of fuel to power its nuclear fusion reactions and collapses in on itself, reaching such phenomenal temperatures that it explodes. The presence of a pulsar in the Crab means that it must have formed in a core-collapse supernova; Type Ia supernovae do not produce pulsars. Theoretical models of supernova explosions suggest that the star that exploded to produce the Crab Nebula must have had a mass of between 9 and 11 M☉. Stars with masses lower than 8 solar masses are thought to be too small to produce supernova explosions, and end their lives by producing a planetary nebula instead, while a star heavier than 12 solar masses would have produced a nebula with a different chemical composition to that observed in the Crab. A significant problem in studies of the Crab Nebula is that the combined mass of the nebula and the pulsar add up to considerably less than the predicted mass of the progenitor star, and the question of where the "missing mass" is remains unresolved. Estimates of the mass of the nebula are made by measuring the total amount of light emitted, and calculating the mass required, given the measured temperature and density of the nebula. Estimates range from about 1–5 solar masses, with 2–3 solar masses being the generally accepted value. The neutron star mass is estimated to be between 1.4 and 2 solar masses. The predominant theory to account for the missing mass of the Crab is that a substantial proportion of the mass of the progenitor was carried away before the supernova explosion in a fast stellar wind. However, this would have created a shell around the nebula. Although attempts have been made at several different wavelengths to observe a shell, none has yet been found. 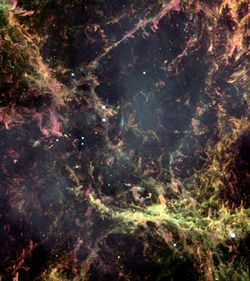 Hubble Space Telescope image of a small region of the Crab Nebula, showing Rayleigh–Taylor instabilities in its intricate filamentary structure. Credit: NASA/ESA. The Crab Nebula lies roughly 1½ ° away from the ecliptic—the plane of Earth's orbit around the Sun. This means that the Moon—and occasionally, planets—can transit or occult the nebula. Although the Sun does not transit the nebula, its corona passes in front of it. These transits and occultations can be used to analyze both the nebula and the object passing in front of it, by observing how radiation from the nebula is altered by the transiting body. Lunar transits have been used to map X-ray emissions from the nebula. Before the launch of X-ray-observing satellites, such as the Chandra X-ray Observatory, X-ray observations generally had quite low angular resolution, but when the Moon passes in front of the nebula, its position is very accurately known, and so the variations in the nebula's brightness can be used to create maps of X-ray emission. 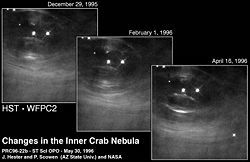 When X-rays were first observed from the Crab, a lunar occultation was used to determine the exact location of their source. The Sun's corona passes in front of the Crab every June. Variations in the radio waves received from the Crab at this time can be used to infer details about the corona's density and structure. Early observations established that the corona extended out to much greater distances than had previously been thought; later observations found that the corona contained substantial density variations. Very rarely, Saturn transits the Crab Nebula. Its transit in 2003, was the first since 1296; another will not occur until 2267. Observers used the Chandra X-ray Observatory to observe Saturn's moon Titan as it crossed the nebula, and found that Titan's X-ray "shadow" was larger than its solid surface, due to absorption of X-rays in its atmosphere. These observations showed that the thickness of Titan's atmosphere is 880 km. The transit of Saturn itself could not be observed, because Chandra was passing through the Van Allen belts at the time. ↑ 1.0 1.1 1.2 1.3 SIMBAD, Results for NGC 1952, Astronomical Database. Retrieved December 16, 2008. ↑ D.L. Kaplan, S. Chatterjee, B.M. Gaensler, and J. Anderson, A Precise Proper Motion for the Crab Pulsar, and the Difficulty of Testing Spin-Kick Alignment for Young Neutron Stars, Astrophysical Journal 677: 1201. Retrieved December 16, 2008. ↑ 3.0 3.1 3.2 Virginia Louise Trimble, The Distance to the Crab Nebula and NP 0532, Publications of the Astronomical Society of the Pacific 85 (507): 579. Retrieved December 16, 2008. ↑ Sidney van den Bergh, The Astrophysical Journal 160: L27. ↑ Apparent Magnitude of 8.4 - distance modulus of 11.5 ± 0.5 = −3.1 ± 0.5. ↑ K. Glyn Jones, The Search for the Nebulae, Journal of the History of Astronomy 7: 67. ↑ K. Lundmark, Suspected New Stars Recorded in Old Chronicles and Among Recent Meridian Observations, Publications of the Astronomical Society of the Pacific 33: 225. Retrieved December 16, 2008. ↑ 9.0 9.1 N.U. Mayall, The Crab Nebula, a Probable Supernova, Astronomical Society of the Pacific Leaflets 3: 145. Retrieved December 16, 2008. ↑ George W. Collins, II, William P. Claspy, and John C. Martin, [http://adsabs.harvard.edu/abs/1999PASP..111..871C A Reinterpretation of Historical References to the Supernova of A.D. 1054,] The Publications of the Astronomical Society of the Pacific 111 (761): 871-880. Retrieved December 16, 2008. ↑ R.A. Fesen and R.P. Kirshner, The Crab Nebula. I - Spectrophotometry of the filaments, Astrophysical Journal 258 (1): 1-10. Retrieved December 16, 2008. ↑ Iosif Shklovskii, On the Nature of the Crab Nebula’s Optical Emission, Doklady Akademii Nauk SSSR 90 (1953): 983. ↑ B.J. Burn, A synchrotron model for the continuum spectrum of the Crab Nebula, Monthly Notices of the Royal Astronomical Society 165: 421. ↑ M.F. Bietenholz, P.P. Kronberg, D.E. Hogg, and A.S. Wilson, The expansion of the Crab Nebula, Astrophysical Journal 373: L59-L62. Retrieved December 16, 2008. ↑ NASA, Animation showing expansion from 1973 to 2001. Retrieved December 16, 2008. ↑ Virginia Louise Trimble, Motions and Structure of the Filamentary Envelope of the Crab Nebula, Astronomical Journal 73: 535. Retrieved December 16, 2008. ↑ M. Bejger and P. Haensel, 2003, Accelerated expansion of the Crab Nebula and evaluation of its neutron-star parameters, Astronomy and Astrophysics 405: 747–751. Retrieved December 16, 2008. ↑ D.A. Green, R.J. Tuffs, and C.C. Popescu, Far-infrared and submillimetre observations of the Crab nebula, Monthly Notices of the Royal Astronomical Society 355 (4): 1315-1326. Retrieved December 16, 2008. ↑ 19.0 19.1 Robert A. Fesen, J. Michael Shull, and Alan P. Hurford, An Optical Study of the Circumstellar Environment Around the Crab Nebula, Astronomical Journal 113: 354-363. Retrieved December 16, 2008. ↑ 20.0 20.1 Gordon M. MacAlpine, Tait C. Ecklund, William R. Lester, Steven J. Vanderveer, and Louis-Gregory Strolger, A Spectroscopic Study of Nuclear Processing and the Production of Anomalously Strong Lines in the Crab Nebula, The Astronomical Journal 133(1): 81-88. Retrieved December 17, 2008. ↑ R. Minkowski, The Crab Nebula, Astrophysical Journal 96: 199. ↑ J.G. Bolton, G.J. Stanley, and O.B. Slee, Positions of three discrete sources of Galactic radio frequency radiation, Nature 164: 101. ↑ 23.0 23.1 S. Bowyer, E.T. Byram, T.A. Chubb, and H. Friedman, Lunar Occultation of X-ray Emission from the Crab Nebula, Science 146: 912–917. ↑ R.C. Haymes, D.V. Ellis, G.J. Fishman, J.D. Kurfess, and W.H. Tucker, Observation of Gamma Radiation from the Crab Nebula, Astrophysical Journal 151: L9. ↑ C. Del Puerto, Pulsars In The Headlines, EAS Publications Series 16: 115–119. ↑ M. Bejger and P. Haensel, Moments of inertia for neutron and strange stars: Limits derived for the Crab pulsar, Astronomy and Astrophysics 396: 917–921. Retrieved December 17, 2008. ↑ F.R. Harnden and F.D. Seward, Einstein observations of the Crab nebula pulsar, Astrophysical Journal 283: 279–285. ↑ W.J. Kaufmann, Universe, 4th ed. (New York, NY: Freeman press, 1996, ISBN 9780716719274), 428. ↑ J.J. Hester, P.A. Scowen, R. Sankrit, F.C. Michel, J.R. Graham, A. Watson, and J.S. Gallagher, The Extremely Dynamic Structure of the Inner Crab Nebula, Bulletin of the American Astronomical Society 28: 950. ↑ K. Nomoto, Evolutionary models of the Crab Nebula's progenitor, The Crab Nebula and related supernova remnants; Proceedings of the Workshop, (A86-41101 19-90). Retrieved December 17, 2008. ↑ 31.0 31.1 K. Davidson and R.A. Fesen, Recent developments concerning the Crab Nebula, Annual review of astronomy and astrophysics (A86-14507 04-90) 23 (507): 119-146. Retrieved December 17, 2008. ↑ D.A. Frail, N.E. Kassim, T.J. Cornwell, and W.M. Goss, Does the Crab Have a Shell? Astrophysical Journal 454: L129–L132. ↑ T.M. Palmieri, F.D. Seward, A. Toor, and T.C. van Flandern, Spatial distribution of X-rays in the Crab Nebula, Astrophysical Journal 202: 494–497. ↑ W.C. Erickson, The Radio-Wave Scattering Properties of the Solar Corona, Astrophysical Journal 139: 1290. ↑ K. Mori, H. Tsunemi, H. Katayama, D.N. Burrows, G.P. Garmire, and A.E. Metzger, An X-Ray Measurement of Titan's Atmospheric Extent from Its Transit of the Crab Nebula, Astrophysical Journal 607: 1065–1069. Aharonian, Felix A. 2003. Very High Energy Cosmic Gamma Radiation. River Edge, NJ: World Scientific. ISBN 9810245734. Kaufmann, W.J. 1996. Universe, 4th edition. New York, NY: Freeman press. ISBN 9780716719274. Lozinskaya, Tatjana A. 1991. Supernovae and Stellar Wind in the Interstellar Medium. New York, NY: American Institute of Physics. ISBN 0883186594. Data on the Crab Nebula, on a supernova remnants catalogue managed by David A. Green (University of Cambridge). The Crab Nebula at ESA/Hubble. 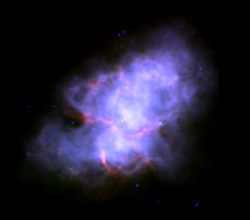 Images of the Crab from the Chandra X-ray Observatory. Hubble Astronomers Unveil "Crab Nebula - The Movie" HubbleSite. NightSkyInfo.com - M1, the Crab Nebula. This page was last modified on 9 December 2017, at 16:12.